Weasel's Journey: Things I Like: Baseball. In spite of being perhaps the most unathletic person on the planet, I have been a lifelong lover of sports. Baseball was my first passion. 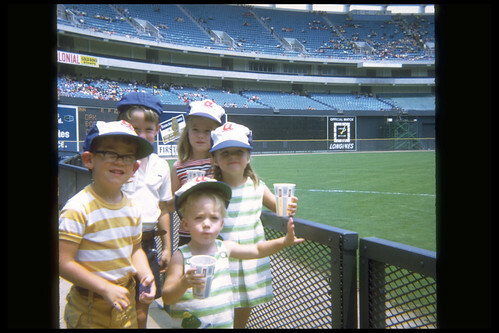 Growing up in Atlanta we went to a lot of Braves games and enjoyed great seats compliments of my dad's job at Coca-Cola (the Braves were terrible in the 70's and I don't think the tickets were in high demand!). I learned to be loyal even when my team wasn't winning, a habit that came in handy when I moved to Texas and eventually transitioned into a Rangers fan. Sadly, the first time in my experience as a fan that the Braves had any success was in 1982 when I went off to college. I can remember calling in to some recorded hotline at the Atlanta Constitution late at night in my dorm room to find out a game score - this was obviously eons before the advent of the Internet! This weekend Robert was offered tickets to Game Two of the American League Championship Series between the Texas Rangers and the New York Yankees. He happily accepted and kindly took me with him. It was my first time to attend a post-season baseball game, and I thoroughly enjoyed it. Best of all, the Rangers won! Our hosts from the game on Saturday have invited us back should the Rangers make it to the World Series. I sure hope that works out. 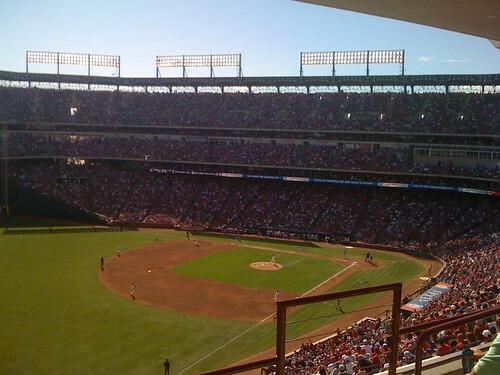 One thing I miss about living in TEXAS is going to Ranger Games. 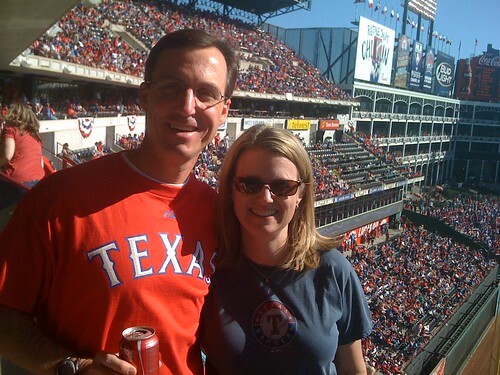 My parents were visiting from TEXAS this past weekend and they LOVE the RANGERS - we watched the games on TV. Tonight's game - in New York - was a great win for the Rangers. DOTR became a Braves fan long before we moved to ATL thanks to Superstation. I remember watching the late games in the tv room at his fraternity house and I can't tell you how many times I went to sleep when we were first married with the Braves on the tv...there were a lot of late games when they were in the NL West. 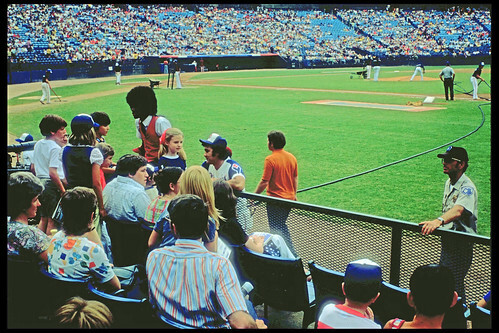 DOTR bought season tickets the year before the Worst to First season (and I chewed him out--remember, it used to be "Go Braves. And take the Falcons with you!") We had season tickets for years, went to many play off games and World Series...such good times. It was sad to see Bobby Cox retire--he was Braves manager for the entire lifetime of three of my four kids! Enjoy the Rangers games, nothing more exciting than that first time winning the division and moving on! I love it when you post all those darling pictures from when you were young! I think it's awesome you have access to them. Go Rangers! So glad they beat the Yankees last night. You know, my Mother loved baseball. She knew everything about it. Runs, Bats, Innings (sp?). I never was able to pick up the same panache she had about it. I even got to see the Oakland A's play the NY Yankees. I just people watched though. I admire your love of the sport. In 1972 I was in 8th grade, and yes, it seems like yesterday. Baseball is right behind football in our house. Unfortunately Chicago isn't doing too well! 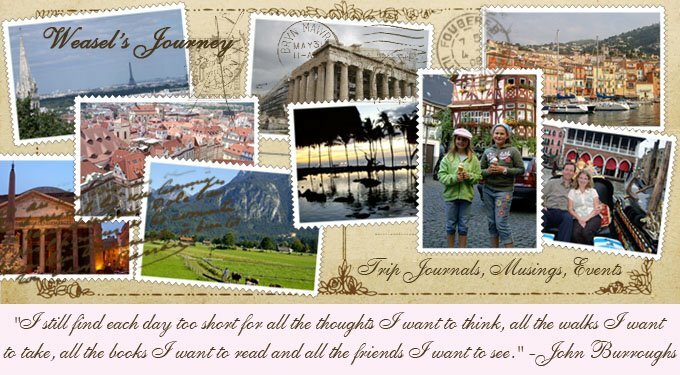 What a wonderful and touching post with your childhood pictures! I thoroughly enjoyed it! Like you, my husband and I were glued to the TV watching the Friday night game. All our prayers were answered! My husband has followed this little team since he was a small child so this is a very moving experience for him. We actually had tickets for game 7, which, thankfully, was not necessary! We are completely OK with that, too, by the way! LOL! Over here in Dallas we will be rooting them on every pitch of the way! They deserve these wins and we have our fingers crossed that they win it all! God bless the Texas Rangers!!! If you DO get to go to one of the WS games, I trust you will do a post and report. I am green with envy!!! Tried to get my hubby to at least try for a single ticket so he could go but says it is no fun to go to something like that alone. 2 seats together would completely blow our budget so we will be very content with TV! Love the fun Braves pictures! Looks like you'll get to enjoy a World Series Game!! Hope you all are doing well - have a lovely week and enjoy the game! Vivian shares her Cranberry Pumpkin Bread.